SHANGHAI - Media Markt, Europe's leading electrical products retailer by market share, has announced that its Chinese joint venture will open a second store in Shanghai. The announcement came just two days after Media Markt China's biggest rival, Best Buy, put up the shutters on its Chinese headquarters and closed all nine stores. 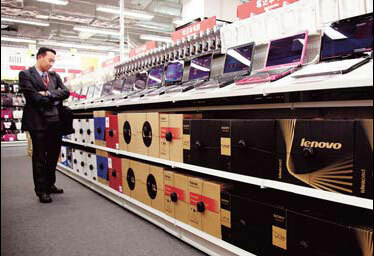 Media Markt China, owned by Germany's Media-Saturn Holdings and its Chinese partner Foxconn, also has plans to operate more than 10 stores in Shanghai by 2012. Furthermore, the company aims to greatly expand its presence by opening more than 100 stores across the country by 2015. The expansion plan comes amid questions about the feasibility of foreign business models for consumer electronics retailing in the Chinese market. On Tuesday, Best Buy announced it will re-evaluate its strategy following the failure of its operation in China. "Media Markt is going to have a challenging time during the growth period in China," said Ben Cavender, associate principal from China Market Research Group (CMRG). The booming e-commerce market in China has eaten into the profitability of electronics retailers, as its lower prices and greater convenience attracts the much sought-after younger consumers. As a result, operating within the traditional distribution channels has become much more difficult. "Consumers can get discounts of more than 10 percent through e-commerce platforms, and price sensitive Chinese consumers can hardly resist such a proposition, especially when they (e-commerce platforms) guarantee the same after-sales service," said Ding Wenjin, an analyst from Dongguan Securities Co Ltd. The growing domestic demand for electronic goods is in sharp contrast to dwindling markets in the United States and Europe, and has persuaded retailers such as Media Markt to increase their presence in China. Zhou Qun, sales and marketing director from GfK Retail and Technology China Co Ltd, told China Daily that he believes the influx of international electronics retailers will intensify the already fierce competition in the local market. He said that leading local retailers such as Gome Electrical Appliances Holding Ltd and Suning Appliance Co Ltd will have to rack their brains to attract consumers, having already slashed profit margins. There is definitely room for good companies to compete, irrespective of whether they are domestic or foreign, said CMRG's Cavender. While price sensitivity may be an issue, it's more a case of companies determining the right mix of products, pricing, service, and store location, he added. GfK's Zhou welcomed the introduction of more international competitors to the market, "New heavyweight players with an international background will facilitate the maturation of the local market, and consumers will benefit from this," he said. According to GfK, China's electronics retail market was worth 990 billion yuan ($150 billion) in 2010, an increase of 17.3 percent year-on-year. The research company estimates the market will increase to 1.1 trillion yuan this year. Ton Wortel, chief executive officer of Media Markt China, said the company's expansion has been rapid, and is proceeding according to plan. "The positive response towards our first store in Shanghai shows that our business concept is working in China," he said. The second store will be located between the residential and commercial areas in central Pudong New Area.